There's a two-pronged hierarchy of Popsicles in the family freezer world. It's two-pronged because, for reasons too mysterious to question, you can't get all six flavors -- lime, banana, orange, cherry, grape, and root beer -- in the same box. At least you couldn't when I was growing up. You either committed to a box of banana, root beer, and lime, or orange, cherry, and grape. My sister had wild tales of lemon as a mythical seventh flavor, but I never believed it. Left: Did you know they've started adding REAL fruit juice and vitamin C to these things? The hell? I harbor a lifelong loathing of bananas. It started out as a simple texture violation that could be generically applied to all things mushy and gooshy -- oatmeal, avocado, cellulitic flan -- but soon expanded to include anything remotely banana-flavored. Ergo, no banana popsicles. Ever! So, I hated banana but I adored lime. It was a lime mania, actually. Not just for lime Popsicles, either, but lime EVERYTHING. The day they briefly added lime Starbursts back to the mix after nearly thirty years was a happy day for me. My dentist was fairly pleased as well, if I recall. And with lime as my favorite and banana as my enemy where did root beer fall in this three-flavor pack? Well, root beer was cool; it was a solid flavor. Somehow no other soda flavors made it into the Popsicles of the 70s and 80s, so that gave root beer a whiff of the exotic. Having said that, root beer also managed to be sort of boring. Cold root beer on a stick wasn't a far cry from cold root beer in a glass. I could get a soda any day. When I went for Popsicles, I went for fake fruit flavors. 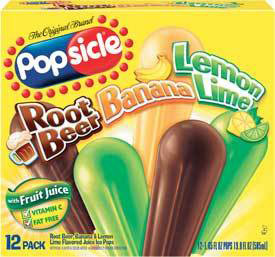 I don't know if the Popsicle makers ever thought to poll people on their flavor preferences and box accordingly, but I do know that when we got the banana-lime-root beer combo there was always a nasty glut of banana. There was also less lime than any other flavor. On one horrible day, my mom brought home a box that contained a single lime Popsicle -- one! -- and my sister strong-armed it away from me. She liked banana well enough, but she also knew I loved my lime. And she was bigger and older. And sort of an angry eleven-year-old. I went on a Popsicle fast that box. I would rather starve myself of all Popsicles than defile my mouth with banana or root beer. I felt rather noble for a sweaty eight-year-old. I made it up by going on a lime binge the next time around. The cherry-orange-grape box excited less violent emotions. Depending on your mood, grape or cherry was the preferred flavor. Grape, if you wanted something with a dusky juiciness or a sweetness that bordered on sickening; cherry if you craved something on the tart side. Cherry also had the added benefit of standing in as pre-teen lipstick. My older sister would trace cold red lips with the slick, rounded end of the Popsicle and then try to smear me with sticky kisses that weren't so much about affection as they were a sibling assault. Orange was fine and inoffensive, but it was also the red-headed stepchild of the cherry-grape-orange box. It was the flavor left in the bottom of the box when all others had been consumed. It was also the flavor voted "most likely to piss you off if you got it by accident" by the Popsicle senior class. There were no labels on the opaque white Popsicle paper telling you what flavor you were getting. All you could do was pull the paper taut over the frozen treat and squint at the shadowy form within, straining to discern a color. Grape was easy because it was so dark, but orange could -- and often did -- attempt to pass itself off as cherry. Almost as if it knew impersonation was the only way it would be chosen. Poor, beleaguered orange Popsicle. I'd definitely eat it before I'd eat banana, but when I did, I was always slightly suspicious that my mom was getting away with giving me something heathy. I developed that particular childhood cynicism only after my mother's intense but blessedly brief mania with Tupperware Popsicles.